Tensile strength is the measure of how much stress a material can withstand without breaking. The amount of stress, in the form of pulling and stretching, a material can handle before it breaks is its tensile strength. Paper, because it rips easily, has low tensile strength. A sheet of metal, which is hard to rip apart, has high tensile strength. An iron girder, used to brace buildings, has tensile strength that’s higher still. One way to increase the tensile strength of an object is to change the material the object is made from. Cars are made from sheets of metal instead of sheets of paper because a paper car is not going to last very long. 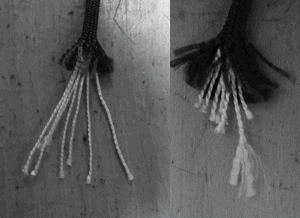 Another way of increasing tensile strength is to stack or weave multiple strands of the same material together. It’s easy to rip one piece of paper but much harder to rip a thick stack of papers bound together in a book. Multiple sheets put together create higher tensile strength which leads to a better ability to handle stress. It’s true, there is tensile strength in numbers. Parachute cord requires high tensile strength because it’s holding something extremely important: your body thousands of feet above the earth. But parachute cord needs to be relatively light and flexible too. It has to go up in a plane, be folded into a backpack and when the parachute is deployed the cord must withstand the upward force of air pushing against the inside of the parachute. A heavy steel chain would be strong enough to handle the weight of a human being but it wouldn’t fulfill the other needs of parachuters, mainly floating safely to the ground. Parachute cord is a marvel of lightness and strength. The strength, which for us means tensile strength, is produced by weaving multiple strands of thin cord into one thick cord. The individual strands are themselves composed of hair thin strands woven together. This double weaving of strands creates a super strong cord. Sometimes it’s easy to believe that all it takes is ONE action to help us remain strong. We want to believe just one change is needed for us to better handle stress and adversity. It’s tempting to think that if we just changed jobs or took a Pilates class or ditched a boyfriend or stopped eating junk food or moved to another city our life would be much better and we could handle our remaining stress better. Although this might be true in some cases, for most of us we need to weave together all the strands of our life to increase our tensile strength. Are we enjoying our work? Are we exercising regularly? Are we in a fulfilling relationship? Do we eat healthy food? Do we have a supportive, joyous community we are a part of? Do we get enough sleep? When all of these together lean towards the positive we are able to handle much more stress in our lives without breaking. We bend but we don’t break. We mind elevaters can jump out of an airplane, which is our aspirations, and land safely on the ground to a realization of our dreams.